When should an ant colony invest in reproductives? Those of you who were into ants in the early ’90s might remember SimAnt, a simulation game where you control the decisions your ants make to steer a colony to dominance over a competing species in a suburban lawn. The secret is that colonies produce more reproductives- and hence spread more quickly- when they begin life churning out only workers. Once they pass a certain size, successful colonies switch abruptly and entirely to reproductives. By not diverting early resources into males and gynes, a colony builds a stronger worker force and grows more quickly than colonies that trickle out a few reproductives at a time. Once a colony switches full-bore into alate production it quickly swamps out the accumulated gradual reproductive efforts of the competition. New Forelius mccooki reproductives in the nest. Arizona. This temporal division of caste production favoring growth first and reproduction second is how to win SimAnt. Just allocate no resources to alates at the start, and once your colony is impressively large allocate everything to them. The competing red ants simultaneously straddle growth and reproduction, do neither well, and fall behind. There is some evidence that real-world ants are like SimAnt’s winners. After all, most species don’t produce new males and gynes until colonies reach maturity, and many ants will, at some times of the year, divert a chunk of their resources to a crop of gynes or males. But the allocation is not always complete. And a number of species consistently dribble out reproductives at a low rate, and contra SimAnt, these don’t seem headed for extinction. What gives? 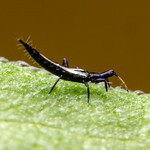 Abstract: Understanding decisions about the allocation of resources into colony growth and reproduction in social insects is one of the challenging issues in sociobiology. In their seminal paper, Macevicz and Oster predicted that, for most annual insect colonies, a bang–bang strategy should be favoured by selection, i.e. a strategy characterised by an ‘‘ergonomic phase’’ with exponential colony growth followed by a ‘‘reproductive phase’’ with all resources invested into the production of sexuals. Yet, there is empirical evidence for the simultaneous investment into the production of workers and sexuals in annual colonies (graded control). We, therefore, re-analyse and extend the original model of Macevicz and Oster. Using basic calculus, we can show that sufficiently strong negative correlation between colony size and worker efficiency or increasing mortality of workers with increasing colony size will favour the evolution of graded allocation strategies. By similar reasoning, graded control is predicted for other factors limiting colony productivity (for example, if queens’ egg laying capacity is limited). Whether SimAnt will ever be revived with the newer equations is another question. source: Poitrineau, K., Mitessor, O., Poethke, H. J. 2009. Workers, sexuals, or both? Optimal allocation of resources to reproduction and growth in annual insect colonies. Insectes Sociaux, online early. doi: 10.1007/s00040-009-0004-6. I want SimAnt 2.0 for iPhone/iPod touch. Now that would be a cool game. Nice paper too. I will look forward to reading it more thoroughly. I want a full blown 3D version of Sim Ant that has multiple species running around a mixed environment or multiple locations. And allow a little more control over the simulation aspect there. Maybe even a create an ant feature (to add ants that aren’t in the game). There were a lot of great “Sim” titles out in the 90s. I enjoyed SimTower the most. I wish they would re-release some of those older games so they can be played on Windows XP. There was Empire of the Ants too, but it sucked. It had nice graphics. I am not a big fan of simulation games like SimAnts. I’d like a screen saver! The best one (not a simulator) is from ATI: http://ati.amd.com/developer/demos/r9700.html (Moebius). OHH Some very interesting and insightful thoughts. I like this. I would like something that encompasses several insect species. Like wasps, hornets, bees, ants etc. Where you would have to start as a single queen for all of them fly from the mating flight and make a nest. Ants would have multiple species that could be selected. 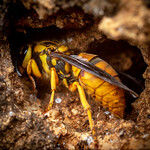 Wasps and hornets would need to collect insects to full growth as well as wood shavings to fuel the nests expansion. I have many good ideas but it is a shame that there are so few games that have good game play and graphics that would have realism as well.